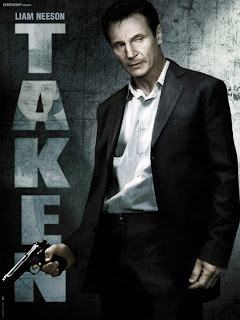 I Me My: 'Taken' ...for a Ride? I was given to believe that "Taken" was a 'thriller with a difference'. I was told this movie would make for an 'on the edge of your seat' kind of an experience. I also read that it was a thriller that would 'touch your heart'. Admittedly, the last comment had me suspect, but unfortunately, I got cajoled into watching 'Taken' where Liam Neeson attempts to rescue his naive 19 year old, on a visit to Paris, from the clutches of a flesh trading, Arabic speaking, immigrant-Albanian mafia. It was an ordeal to watch an aged Neeson fight ten thugs at a time and come out unscathed! Furthermore, it is become so predictable nowadays to have the bad guys speak Arabic, just as it is for the evil king-pin to be a sheikh! I could have perhaps tolerated all this, if I could have at least 'felt' for the 19 year old who had fallen prey. Alas, those were not the emotions she evoked in me; she was the stereotypical rich, spoiled, immature American teenager who is oblivious to anything beyond the reaches of her nose, and is therefore begging to be 'taken', and it is no surprise she is. You can spare yourself the torture of being "taken', even if it's only for a hundred minutes! it is become so predictable nowadays to have the bad guys speak Arabic, just as it is for the evil king-pin to be a sheikh!.. "bad guy? must be a black! " is now changing to "bad guy? must be a black or an arab! " the immigrant-Albanian mafia sounds cool (and the only reason to watch the movie!)... is the days of serbs being bad guys everywhere in europe over? but i'll take your hint. In defence of Art !